Implementation of a safety cage according to Annex J FIA for the one-off TZ3 Corsa, winner of the Design Concept Award of the 2010 Villa d’Este competition, as well as the tubular body protection and support structure of the TZ3 road version, made in small series approved for road use. The Sassa Roll-Bar has created safety cages for Lotus cars with an aluminum frame, developing the gluing to the frame with specific glues and the creation of fastening plates, profiles and complex development. The same methodology is applied to the frames the composite materials, now very widespread in the automotive panorama. A special place in the Sassa Roll-Bar curriculum is dedicated to collaborations with Graziano Rossi and his achievements used for spectacular appearances in Rallies, Salts or Drifting. In addition to the Mustang and the Corvette, worthy of note was the creation of the Viper characterized by the tubular frame, with specific processing. Giovanni Trincossi, Autocross Plurivincitore of the CEZ championship (Central Europe Zone) and current Italian champion in the SuperBuggy category, has chosen the SASSA ROLL-BAR for the realization of the tubular frames for “his” creature, commissioning work on his specification. 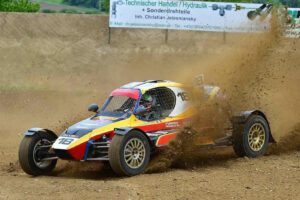 Trincossi has concluded the FIA-CEZ Central European Autocross Championship in third place just 2 points behind the winner, while in the Austrian championship he is vice-champion only one point behind the winner.